You may have heard that “greywater systems,” which reuse water from sinks, showers, laundry, and other non-toilet drains, can help you reduce water use. It can also save money on water and sewer charges, improve landscape and garden irrigation, or prolong the life of your septic tank. But knowing where to start isn’t easy. Here’s our guide to “going grey” no matter what your budget. For a little extra cash, you can also buy “toilet top sinks” that pull water for flushing through a tank-top sink first. Wash your hands and the grey water gets used to refill the toilet tank immediately. Available systems (details here and here) install without tools or plumbing know-how. Pros: Basically free — and it’s a renter-friendly application if you have enough uses for the water. Cons: Definitely not a set-it-and-forget it system. Requires continuous elbow grease to keep the bucket system operating. You need: A bucket and strong arms. Estimated Cost: $5 for a pair of buckets per bathroom. $100 and up for a toilet-top sink. If you’ve got a yard that needs watering, consider diverting water from your washing machine to the lawn. Because laundry pipes are typically visible on the home and placed on an exterior wall, they’re easy targets for a DIY project. (You can read Greywater Action's do-it-yourself guide here.) Other home drains — a tub or shower with an accessible drainpipe and sink drains, e.g. — may be possible candidates as well. In California, as of January 27, 2010, no permits are required for this laundry-to-landscaping system. Check Randy Potter's Q&A "Is it feasible to reuse greywater as irrigation water?" for details. Pros: Low material cost, and simple enough for the home handyman to tackle alone. It’s also the least difficult to maintain. Cons: Limited impact on overall water use. Average washing machines consume about 40 gallons of water per load. In California, new home landscaping accounts for an average of 270 gallons a day [pdf]. May also run afoul of some local building codes; be sure to check with your local agency. You need: Good handyman skills, a few pieces of plumbing and hardware, some mulch, non-toxic phosphate-free detergents, a washing machine, and landscaping or a lawn. Estimated cost: $250-500 per drain. 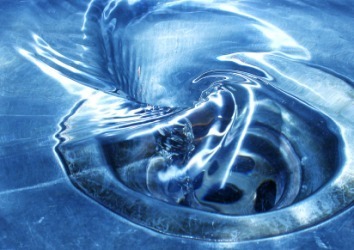 Use water from sink drains to flush your toilet. Why waste potable water on poo? That’s the scatalogical logic behind a bathroom greywater system, but the idea comes with a hefty price tag. DIY versions of the sink-to-toilet system are available, but for the most sanitary, out-of-the box solution, you’ll want to choose commercial systems such as those from Brac Systems or Sloan. For smaller applications, Christian Kienapfel, an architect with Paravant Architektur, recommends Sloan’s “micro” greywater system, the AQUS, in this Q&A. “This is an easy retrofit application for existing homes,” he writes. According to the EPA, household bathrooms account for more than 50% of indoor water use, so grey water systems that can cut that in half can have a major impact on overall household water use. Pros: Integrates into your home plumbing system. Professional systems are warrantied and approved by some local building codes. Cons: The most costly system. Requires maintenance of collection and treatment aspects of the system. You need: Good working knowledge of your existing water use, a good plumber, a complete system — including collection, storage, water treatment, and re-piping — of your choice, and (a lot) more than $1,000.